The most important adage to remember for the surgical management in traumatic orthopaedic complaints is ‘Reduce – Hold – Rehabilitate’. In the context of high-energy injuries, this is precluded by resuscitation following ATLS (Advanced Trauma Life Support) principles (beyond the scope of this article). Reduction in the traction on the surrounding soft tissues, in turn reducing swelling (excessively swollen soft tissues have higher rates of wound complications, and surgery may be delayed to allow this to regress). The main principle in any reduction, regardless of the method employed, is to correct the deforming forces that resulted in the injury. Prior to this, some clinicians may suggest an initial exaggeration of the fracture, before the definitive reduction manoeuvre, aiding to uncouple the proximal and distal fracture fragments. Fracture reduction is typically performed closed in the emergency setting. However, some fractures are also reduced open (by directly visualising the fracture and reducing it with instruments) or intra-operatively. Reduction is painful and requires analgesia. Where regional or local blockade is both sufficient and easily provided (e.g. phalangeal/metacarpal/distal radius fractures), this would be the method of choice. The specific manoeuvre used invariably requires two people (one to perform the reduction manoeuvre and one to provide counter-traction). ‘Hold’ is the generic term used to describe immobilising a fracture. Initially, it is important to consider whether traction is needed. This is most commonly employed for subtrochanteric neck of femur fractures, femoral shaft fractures, displaced acetabular fractures, and some pelvic fractures, whereby the muscular pull across the fracture site is strong and the fracture is inherently unstable. If there is axial instability (whereby the fracture is able to rotate along its long axis), such as combined tibia/fibula metaphyseal fractures or combined radius/ulna metaphyseal fractures, the plaster should cross both the joint above and below. These are usually termed ‘above knee’ or ‘above elbow’ plasters, respectively, preventing the limb to rotate on its long axis. For most other fractures, the plaster need only cross the joint immediately distal to it. Can the patient weight bear? – this varies depending on fracture, however you should always inform the patient of this. Do they need thromboprophylaxis? 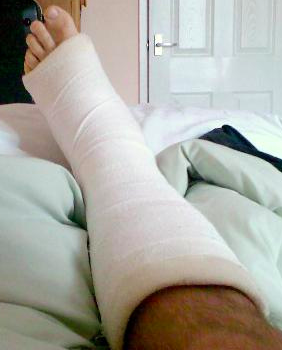 – if the patient is immobilised in a cast and is non-weight bearing, it is common to provide thromboprophylaxis. Have you provided advice about the symptoms of compartment syndrome? – patients should be advised that if they develop any features of compartment syndrome to return to A&E for further assessment. Remember, the definitive method of ‘holding’ the fracture might be surgical intervention. This refers to the need for most patients to undergo an intensive period of physiotherapy following fracture management. Invariably, patients are stiff following immobilisation and the therapists are therefore essential to successful recovery. It is therefore also important to ensure that patients are advised to move non-immobilised unaffected joints from the outset. It is also important to remember that many fractures occur in frailty and render the patient with an inability to weight bear or use an arm, having profound effects on their ability to cope at home. Therapists are therefore essential in making sure that this group have suitable adaptations implemented for them during their recovery.